For the past few weeks, I’ve always been looking for a great book, a book about China and sports in English that I could recommend to my dear readers of this blog. And now I am happy that I found one. 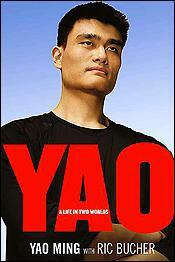 “YAO: A Life in Two Worlds” is a memoir by Yao Ming with Ric Bucher, an ESPN the Magazine writer, published by Miramax Books in September 2004. I really found a lot of fun and inspiration from reading the book. What is really special about this book is that it not only provides many behind-the-scenes stories of “how a tall, skinny kid from Shanghai, whose parents had higher hopes for him than playing basketball, became an NBA star and thereby a living symbol for a country of 1.3 billion people”, but also provides a unique perspective to see the world in Yao Ming’s eyes as he went through those big and small events in his amazing journey. Through this perspective, you will find out how Yao Ming thought and how the Chinese culture, tradition and education have influenced him in making those important decisions in his basketball career and life. Therefore, it is not only a great book that will help you learn the journey of the best basketball player ever to come out of China, but also a unique one to help you get a huge amount of insights about China’s culture and sports system. Although it was published in 2004, most of the insights from the book are as true and useful now as then. Following are two Editorial Reviews that will help you get a glimpse of this book. This book is available on Amazon, you can click here to check it out. You can also find a nice excerpt of the book by click here. I look forward to hearing about your thoughts of this book soon. Yao, the 7’5″ Chinese NBA center, charms readers with the same grace and humility that have made him one of basketball’s most mediagenic personalities. Coauthored by Bucher, an ESPN the Magazine writer, the book includes short sections by Yao’s Houston Rockets teammates and managers, but its driving voice is 23-year-old Yao’s. The language is simple, sincere and often funny as Yao jokes about Wilt Chamberlain’s reputation as a ladies’ man and presents a view of himself as a blue-collar worker (“I sweat for my paycheck”). The book follows Yao’s career in China, the bureaucratic struggles involved in getting him to the U.S., and his experiences on the court, including what it was like to play against Shaq. Though there’s lots of basketball talk, the book’s most compelling sections address the clash of cultures, such as the time when Yao’s former team, the Shanghai Sharks, banned one of Yao’s representatives from negotiating because he was white. Yao clearly loves his native country and says his greatest dream is to lead China’s national team to an Olympic gold medal. But with millions in endorsement deals, the adoration of fans across the globe and this earnest book, it’s clear he’s living out the American dream, too. Photos. Copyright © American Library Association. All rights reserved –This text refers to the Hardcover edition.